Finally! 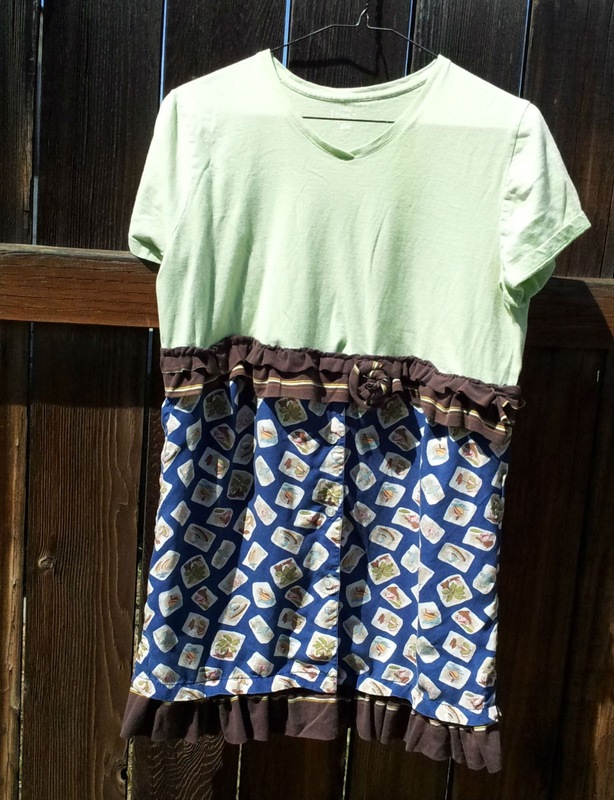 Made Something That I Could Wear! I have been having fun at the thrift store bag day. But I'm terrible at remembering to look at the sizes. I look at style and what I can make from it with blinders on. I get home, wash everything and realize everything is small or medium. Sorry girls, I'm not a small or medium. Not for at least 30 years at least. 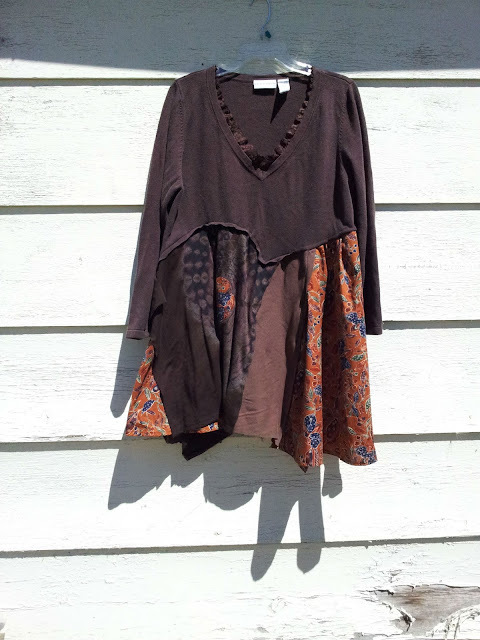 Going through my basket of possibilities I found this luscious brown top in a large. It was nice and stretchy. Perfect! I found some other chocolate brown tops begging for upcycling. 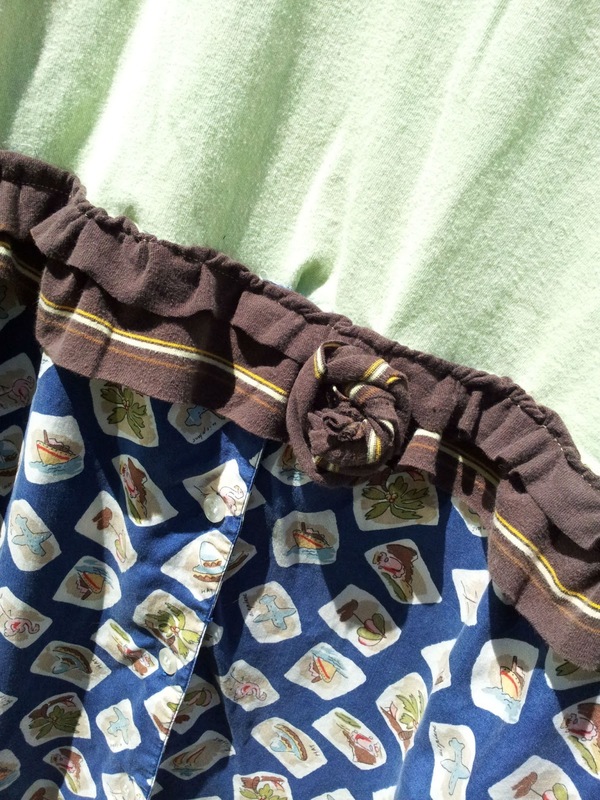 I had a skirt I had attempted to make sooo many years ago. I found it trying to organize my sewing room the other day and decided it was a perfect addition. So here is my new creation. I tried it on and Lo and behold, it fit. Of course I had to add it to my Etsy store. Can't make a sale if I keep everything cool! Nice thing about this outfit is anyone could wear it and look awesome! I found this on my Pinterest page the other day. Thought it was one of the prettiest ways to do a pie. The apples are sliced with a potato peeler into little slivers and layered onto a pudding like bottom. The crust is shortbread. 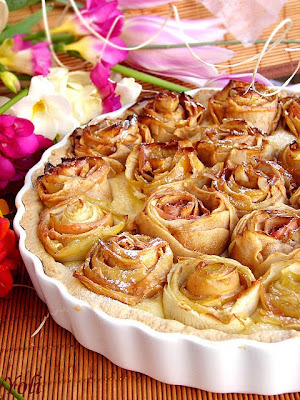 I think it just needs a little caramel drizzled on top.. don't you think? The recipe is actually in Bulgarian but my computer did translate it. However, note that some of the measurements are metric and the oven temp needs to be converted into Fahrenheit. This Is Not A Cat Free Zone! 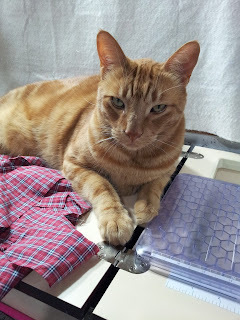 I thought I would do a bit of a post about pet safety in the sewing room. I have to make sure my pins are secure and my scissors are put away. All very nice toys. I actually found his sister with a needle dangling out of her mouth. She had swallowed the thread and the needle was dangling from her mouth. Thankfully I found her just in time! I now put everything under cover. So think about cat safety in your sewing room. They are slick little devils! Pincushions are pretty handy.. to us and them. 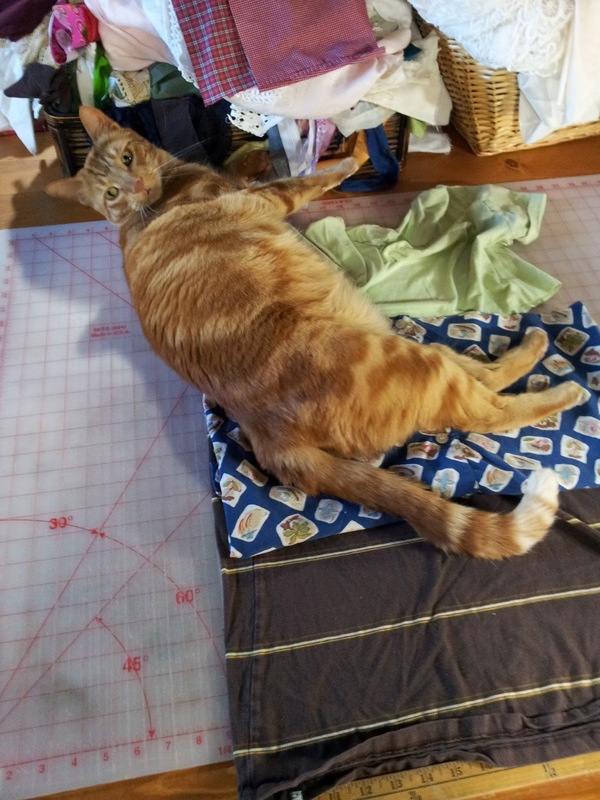 No matter what time of day I head to the basement sewing room. Today I have a Helper. He is very snoopy and always gets in the way. He has his own special way of letting me know something is OK. 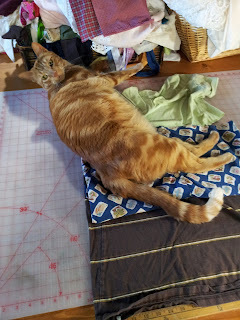 Here he is inspecting an outfit I'm working on. I think I got his approval to proceed. Thankfully despite all his help, I was able to finish up. Here is the approved project. Later All! Enjoy your weekend! Yesterday I just couldn't get into the groove. So I kicked back and enjoyed a day off. 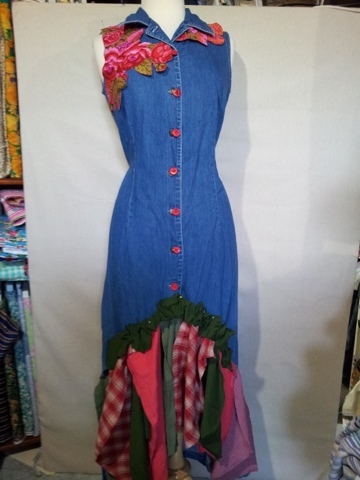 But this morning this denim dress spoke to me. It took a while and I had to pin everything and take a break to see how it felt. I decided I loved it! 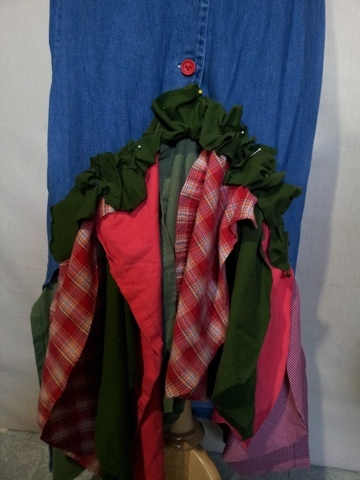 I used some leftover sleeves from some men's plain shirts and t-shirts. I used one of my favorite Kaffe Fassett fabrics for a raw edged appliqué on the shoulders. I love the bottom flair. 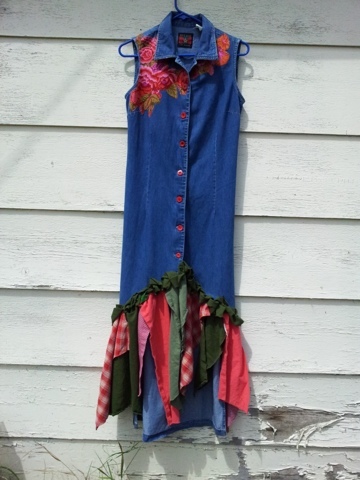 I can just see a cowgirl with her boots and cowgirl hat on the way to a BBQ or country wedding. You can see all my latest creations on my Etsy site. I have an Etsy store I'm trying to make a go at. Every indication is that people like what I make, but no actual buyers yet. Not sure what I'm doing wrong as yet. But the grapevine says volume is what I need. So I have been a very busy bee in my little basement sewing room. I have even decided to add some little girls outfits to the mix. I think I have finally found my calling. 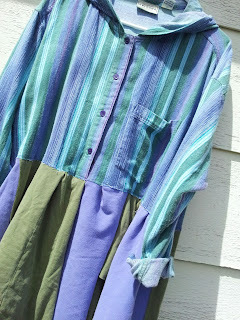 I love mixing and matching thrift-store finds to make something new. I tried to put together a tutorial but none of my outfits ever turns out the way I first plan. The fabric starts to talk to me and it dictates what it wants to become. So here are some of my latest projects. Maybe someday if I can stay on tract I'll put a tutorial together. This was made from a very comfy old hoodie my mom gave me. I cut off the bottom and cut up some t-shirts I found. 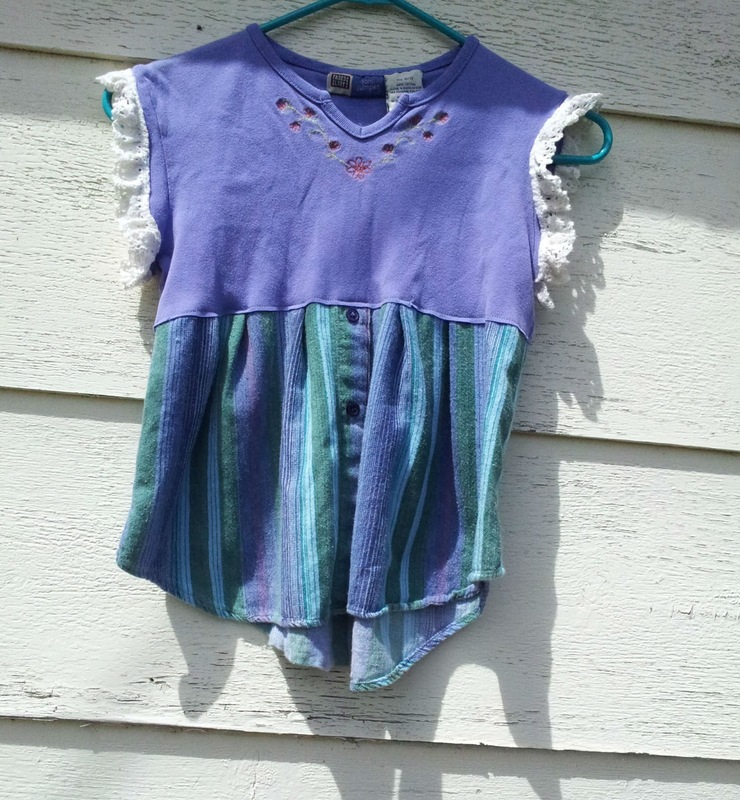 Oh to find more pretty periwinkle purple t-shirts.. my favorite color! They are hard to find. I loved making this dress. I used some wonderful heirloom linens my Grandmother gave me that I knew I would never use. Here is a picture of the back. 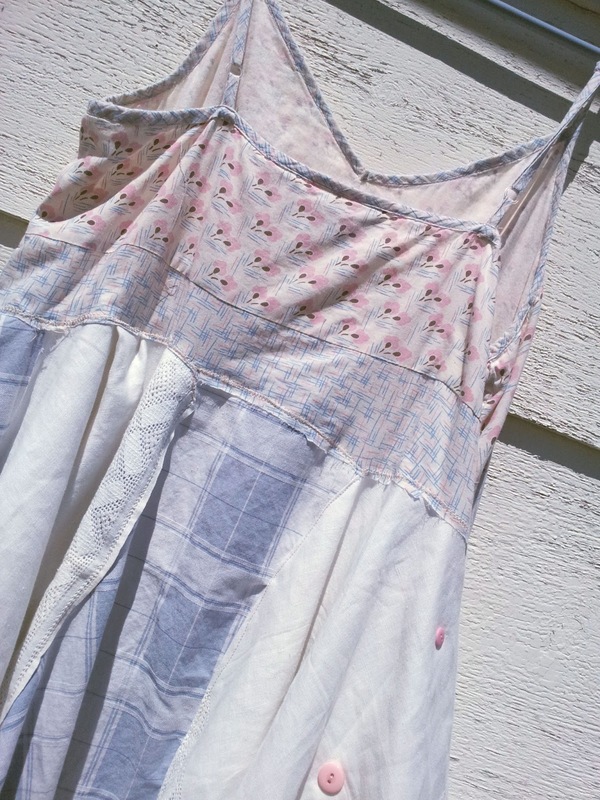 I think it would make a sweet summer country wedding dress... don't you? Here is a little girls top I made from the bottom of the hoodie. 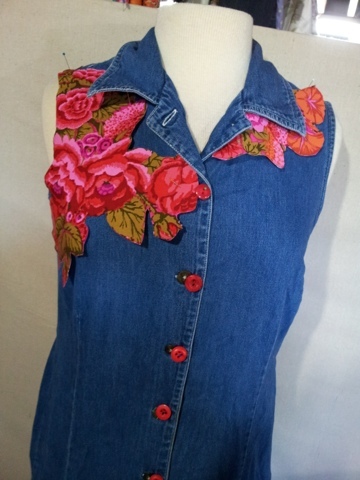 I can just see this with some cute leggings and girls cowboy boots! Too bad I don't have any granddaughters..... yet! 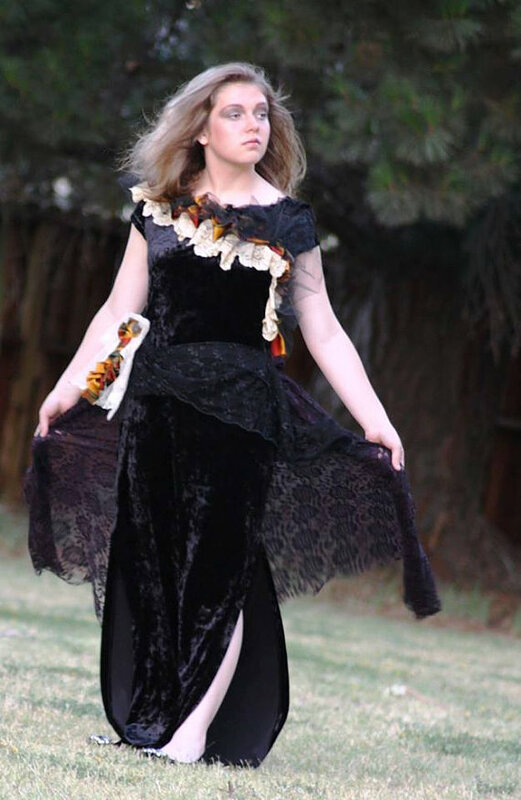 A friend of mine took this picture of her daughter wearing my black velvet creation. Spooky and elegant at the same time. I get lots of lookie loos for this on my Etsy site. It really needs to go home with someone! Anyway, I have been having the time of my life making all these crazy creations. I can only hope that someday they make me the living I'm wanting so bad.